The first thing you notice when you open a bag of Rocky Canyon Pellets is the uniform warm rich red pellets. This is unique only to Rocky Canyon due to the amount and quality of natural Red Fir used in each pellet. Other pellets have a white, grey or even a brown pellet; this is a result of using inferior wood. We choose not to compromise the quality of our pellets by using inferior woods, other fillers or glue. As a result of using the finest natural materials, Rocky Canyon Pellets burn HOTTER, LONGER, and CLEANER. Providing a quality, environmentally friendly method of home heat is our unwavering goal. 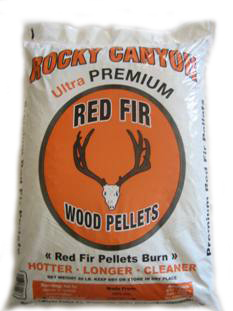 When you use Rocky Canyon you can consistently count on burning the finest quality pellet in the industry.